July 25, 2010 – The issue of reconciliation, which was topical and omnipresent in the public discourse and the South African media in the late 1990s, has been mostly obliterated by other issues. 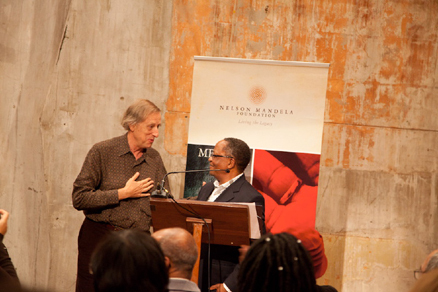 Hence, Professor Njabulo S Ndebele, a trustee of the Nelson Mandela Foundation, senior research fellow of the Archive and Public Culture Research Initiative at the University of Cape Town, and author of The Cry of Winnie Mandela among other novels, chose to bring together Ariel Dorfman, who will deliver the Eighth Nelson Mandela Annual Lecture, and four South African writers of a younger generation at a dialogue held in Cape Town on Friday, July 23, 2010, to explore the subject of reconciliation. Each of the panellists, South African writers born in the 1970s and early ‘80s, debated the idea of reconciliation – what it means and how it affects them, how their writing informs the reconciliatory process and their experience of and engagement with the legacy of apartheid. 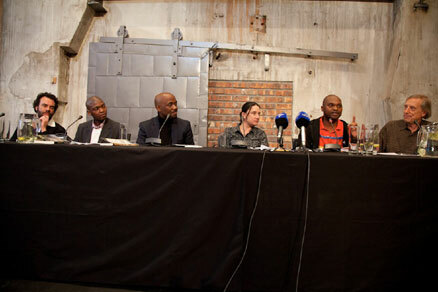 The authors discussed issues such as xenophobic violence, controversial cultural practices and racial division in the country, as well as matters of identity, guilt, anger, and artistic struggle. Writing’s role in steering memory and reconciliation was celebrated and debated. 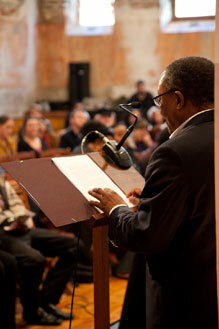 The event attracted an eager audience of about 120 people of various ages and cultural backgrounds. Among them were esteemed members of the South African literary landscape, including writer and poet Antjie Krog, Afrikaans poet and literary theorist Joan Hambidge, anti-apartheid activist and academic Mamphela Ramphele, author Imraan Coovadia, Rivonia trialist Denis Goldberg, writer Nuruddin Farah, Member of Parliament Dene Smuts, US Consul General Alberta Mayberry, activist Shirley Gunn, journalist and activist Terry Bell, poet James Matthews, writer Damon Galgut, anti-apartheid activist Mary Burton, and psychologist and writer Pumla Gobodo-Madikizela, as well as journalists, editors and academics from Cape Town. 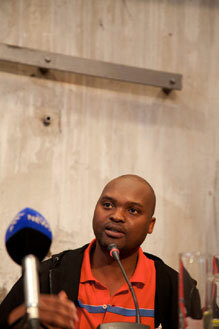 Dlamini illustrated his point by speaking of xenophobic attacks and mutilation in the name of culture, before introducing the first panellist, Thando Mgqolozana. But, he said, when it came to South Africans’ reactions to the matter of “black boys dying”, as seen in Xhosa circumcisions, the reactions “have been very suspect. There’s a sense that we have to keep our hands off culture, and a part of South Africa is sitting in the middle, not wanting to say anything. “Our outrage [at these initiations] has been very peaceful compared to the outrage at the rest of the issues I mentioned. Souls were ruined, sanities stolen. We are compromising reconciliation,” Mgqolozana argued. 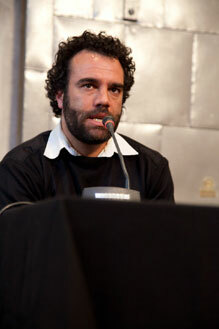 Dlamini introduced the second panellist, journalist, editor and author of Ways of Staying, Kevin Bloom. 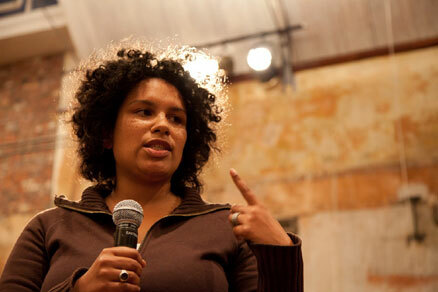 Bloom’s book, said Dlamini, explored “personal justice versus social justice and how these two intersect”. In Ways of Staying, Bloom taps into a personal tragedy as a point of departure to explore the way his relationship with the country has changed. Bloom related his ideas on reconciliation through the character of Themba, who lived just three kilometres from him in Johannesburg. Bloom related how people still live in condemned buildings in the inner city and face routine police brutality and intimidation. Themba lived in fear and packed his bags, saying five words that summed up the South African condition for Bloom: “I’m threatened, I’m not settled. Henrietta Rose-Innes, a novelist, short-story writer and editor, began by explaining that she is not usually thought of as a writer active in the traditional South African political landscape, but that she had stepped into those shoes recently to write a short piece, “Semi-Precious”, which she read to the audience. The autobiographical story relates how she discovered that her beloved childhood home once belonged to an Indian or coloured family, a discovery that she made as a teenager when she recognised the name on one of the walls, painted over but not completely erased, as belonging to a member of the Indian community. Niq Mhlongo then read an excerpt from his debut novel Dog Eat Dog. His characters scorned “the same old rhetoric of reconciliation” and “absurd post-apartheid renaming” of public holidays, specifically Dingaan Day, now the Day of Reconciliation (December 16). “It’s totally blotting out our history,” one character said. “We reconcile in South Africa when it suits us,” Mhlongo commented. 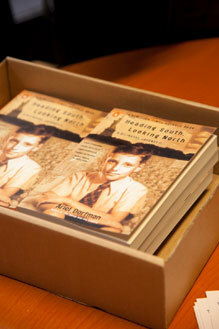 Ariel Dorfman’s life as a human rights activist, and his personal story of exile, writing, struggling, negotiating and reconciling, bears many parallels to the South African narrative. Born in Chile, he fled his country of birth when Augusto Pinochet gained control of the South American country through a violent coup d’état in 1973, and lived in exile for 17 years. 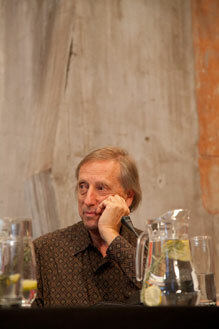 Dorfman spoke of the political and psychological factors at work in his literary career. Speaking of 1973’s Hard Rain, his first novel, he said that at that stage his conscience would not allow him to be a pessimistic writer, so instead he “wrote a mélange of possible scenarios and all of them were relatively wonderful. But I realised later on that I had put the terror in the [secondary] narratives. I did not have the courage to write what I should have written,” he said. Bloom also felt that it was important to always interrogate “how we remember and what we remember”. The floor was then opened for questions and comments. Londi Gamedze, an Honours student at UCT, spoke about a “legacy of unease” that young people in South Africa live with, and that there are “problems that [they have] inherited”, but that it is almost impossible to give these “enemies” a name or a face. Her comments highlighted a deeper problem of insecurities passed on by generations, by the media and by rhetoric – much of which have very few physical manifestations and yet live on psychologically and mentally. 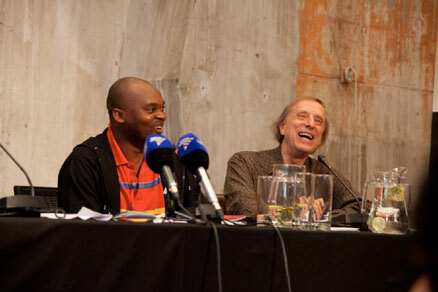 “Let’s turn this event into a process,” urged Dlamini, and the audience showed their agreement with a round of applause.